The Eagles signed Chris Polk, the undrafted free agent running back out of Washington University, quickly following the draft; scraping up possibly the greatest steal in NFL Draft history. Chris Polk was graded as a fourth round pick by the Eagles originally, but talk of a possible degenerative hip condition made his draft stock plummet. There isn’t much evidence to support the claim, but that’s the kind of possible condition that seems to blacklist running backs in the eyes of GMs. Chris Polk is surprisingly shifty for a stocky 5’11” 220lb running back. He has great open field speed, but where he really makes his mark is in traffic. He has great burst and fights through arm tackles, bounces off defenders, and drags potential tacklers down the field. He kind of reminds me of Matt Forte, but shiftier and possibly more blunt as well. I don’t know how he can encompass all these frequently opposite traits at once, but the fact that he can makes for one heck of a football player. He’s like two players combined. He brings a physical presence to the Eagles backfield that could form into a deadly combo with LeSean McCoy. This signing gives us the opportunity to shine light on an Eagles issue that normally hides in darkness. Certain running backs just don’t work in the Eagles offense. They tried to plug Mike Bell into the #2 back spot a few years ago only to trade him to Cleveland to get a relatively successful resulting back in Jerome Harrison, whom they replaced with Ronnie Brown the following year, only to try to trade Brown to Harrison’s new team the Lions, in an attempt to get Harrison back. The trade was actually voided after a physical revealed that Jerome Harrison had a brain tumor, and Ronnie Brown was sent flying back into our laps. Why would the Eagles try to trade for the same running back twice in two seasons? What was so special about Jerome Harrison? And why was he able to have more of an impact than the other two running backs did? Well first of all, Jerome Harrison is still a very young back, which I feel is the crux of this issue. Young legs are what a running back in the Eagles offense needs to be successful. Andy Reid obviously has a desire to have a change of pace back, even though countless analysts knock the Eagles for never seeking one out; but given the breakneck speed at which this offense moves a true change of pace back would probably be more like a flat tire for the offense. Jerome Harrison was bulkier than McCoy but still quite fast. That subtle difference is Andy Reid’s definition of his change of pace back. Chris Polk has the potential to be the new Eagles #2 running back. Because Polk is still very fast he could compliment LeSean McCoy very well and provide that extra smash when needed. 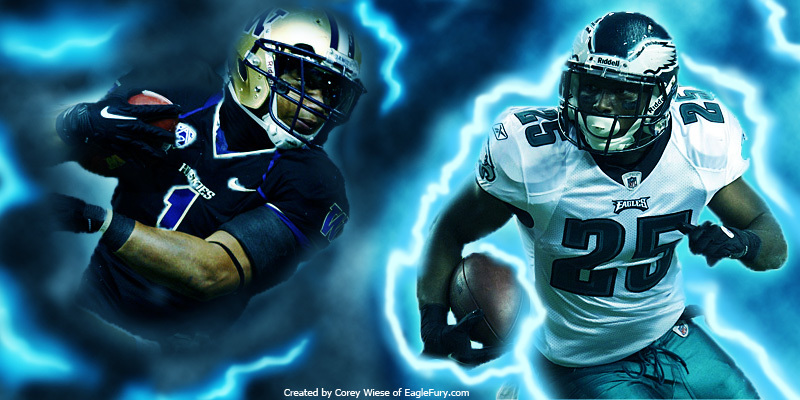 The Eagles may have finally found an epic smashing and dashing running back tandem. Now I know what you’re thinking, what good are two great running backs when all we do is pass? You have a point there. At this moment this potential tandem is more of a moral victory for Eagles fans. If Polk can become an effective NFL rusher then he will be there when we need him. Polk just seems like the kind of player that comes into his own during a late season playoff run, after a year of hearing people say he couldn’t do it; the kind of success that just appears out of thin air and opposing teams can’t stop no matter how much tape they watch. Thinking about what this tandem could be conjures up words like legendary. I don’t throw that word around often. Of course this is all just speculation. We won’t know for quite some time if this tandem will come to life, but this does well to pass the time in the offseason. Do you think Chris Polk could be the missing piece in the Eagles backfield? How amazing could this tandem become?